Find your local seed network! Click here for a map of 100 Local Seed Networks around Australia. 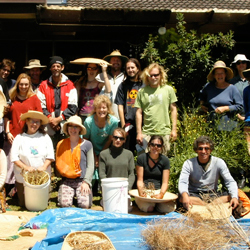 As of 2014 we have opened registration with Seed Savers to seed groups in other countries. Registration is free. What is a Local Seed Network? A Local Seed Network is a group, registered with The Seed Savers’ Network, of three or more people living in the same bioregion who swap seeds and planting material with the purpose of conserving open-pollinated varieties of food plants. For the first twenty years of Seed Savers, from 1986, we collected, trialled, stored and redistributed seed varieties in one location. However once there was enough interest, skills and experience amongst the Australian public it was time to decentralise! Back in 1999 we laid the plans and within ten years. 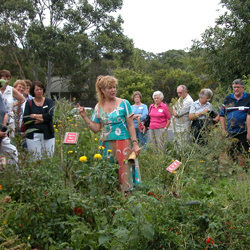 Local Seed Network members are gardeners who are keen to get their hands on tried and true local varieties, from both long-time locals and arrivistes. They want to know how to better save seeds, or otherwise propagate them. They also want to learn how to grow, cook and preserve what grows best locally. Some are experienced seed savers who like to show others how to save seeds, at the same time perhaps accessing something novel from blow-ins. 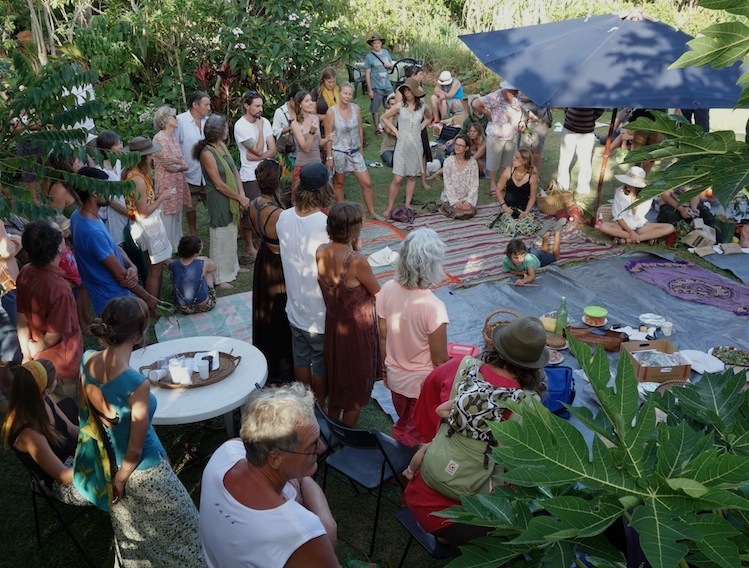 Most of our LSNs meet every couple of months at one another’s gardens. Some groups however meet regularly in a community hall. Most LSNs have a system for swapping seeds, some have a seed bank that travels to events. Each has a LSN Coordinator, usually the person who established the group. Some LSNs have taken up projects, such as helping to start food gardens in a local school, or helping a community garden with seed saving programmes. Others have run annual conferences and others go regularly to markets and similar venues to promote seed saving. Some purchase copies of our “Seed Savers’ Handbook“, other books and DVDs to sell both for promotion and for income-generating. Some promote seed saving through the media like regular radio programmes or columns in the local paper. There is a short Charter defining a Local Seed Network below, at the bottom of the page. Meet new local Seed Savers, have access to local varieties of useful plants, share cuttings and seeds and partake of delicious home-made food from the garden. See how you can help save food plants for the future and eat them too. See list of Local Seed Networks. Starting your own Local Seed Network is simple. When you have registered as a “Seed Saver” (free) hop over to the LSN Registration Page and complete the short registration form. Even if you are part of a Local Seed Network but it is getting too crowded for your taste, you may start your own! Some people start a new one because the existing one is too distant. Violet Town LSN in Victoria did this too. The older LSNs can then become a Regional Seed Network. Each LSN has a coordinator, webpage and forum. Each LSN Coordinator organises meetings, events and keeps the members informed. He or she also administers the webpage which they monitor for comments, posts by members and offers or requests for seeds. LSN Coordinators are encouraged to post regular updates on their webpage with events schedules, reports and seed variety lists. LSN Coordinators take responsibility for the light admin (the less the better) and the fun, such as inviting “Seed Savers” to their meetings. They may organise Christmas or Easter gatherings, solstice celebrations and even garden birthday parties. They also may organise more serious events (such as stalls at agriculture shows), broadcasts through the media, take photos and video clips to upload to their LSN page. Overseeing the Local Seed Networks will be the LSN Administrator, a person who will have an overview of all LSNs in the system and be responsible for activating new Local Seed Networks. Feel free to apply! . The LSN online system facilitates effective communication amongst all members of Local Seed Networks via a familiar forum style platform. A Local Seed Network forum page for your LSN will be created. Community Forum topics include seeds, garden and special food preparations, preserves including probiotics/fermentations, about all matters related to seed, under topics such as Trade/Swap Seed Varieties, Share Knowledge, Propagating Techniques, with other seed savers across the country and the world. Prior to joining a Local Seed Network or starting your own LSN you must register as a Seed Saver. Seed Savers may post content such as images, seed lists, news items, questions and answers, interact directly with each other, require seeds for exchange or garden knowledge with the goal of building a vibrant and sustainable online seedy community. Register a Local Seed Network and be on the map, it is a free service! Any Community Garden, Permaculture group, garden club, school, gardening family or a loose group of gardening friends, may apply to register their own new Local Seed Network. If you are a oollector of plants you are invited to apply. The more active LSNs the safer humanity’s seeds are; the more gardeners grow localized seeds, the finer the nutrition. Your LSN will be added to the LSN Map so others in your town or suburb can locate and join you. There is already nearly to one hundred of them established. 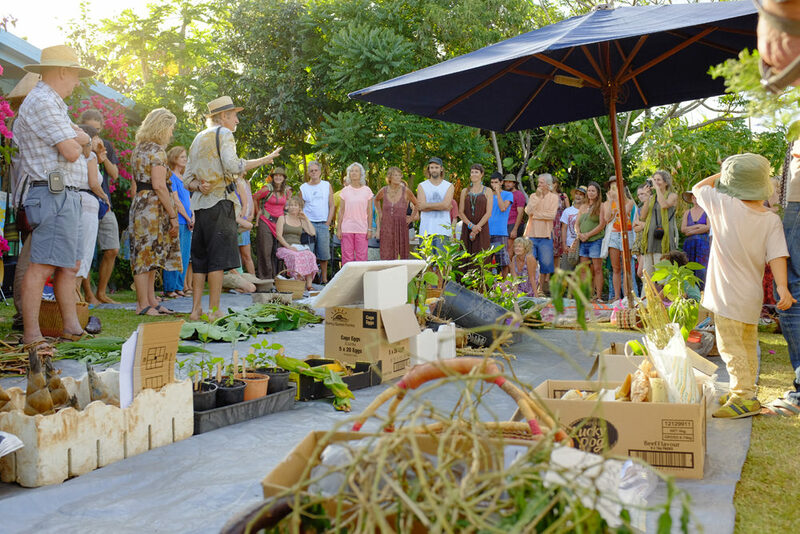 Shared cuttings, plants, seeds and garden produce at a gathering of Byron Hinterland in Byron Bay, March 2014. Local Seed Networks are the key to the survival of our precious plant heritage. 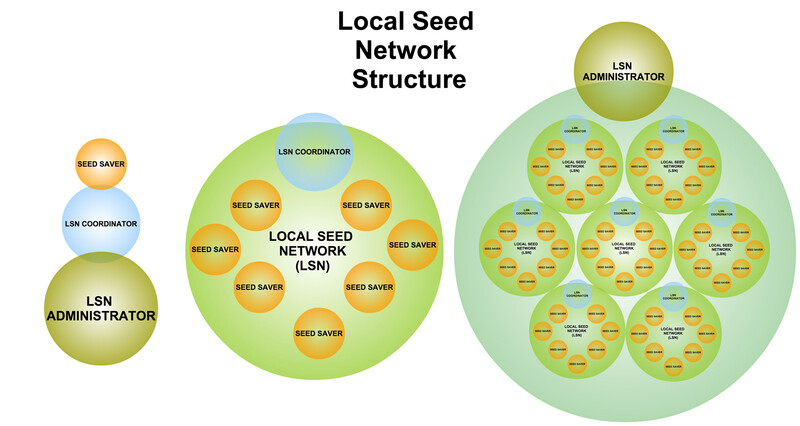 In a nutshell, this is how the Local Seed Network is structured. 1. Individual people may register as a Seed Saver - Allowing them to participate in community forums and to join existing Local Seed Networks. 2. LSN Coordinator is a Seed Saver who registers a Local Seed Network and coordinates gatherings and meetups with Seed Savers in their local community. 3. LSN Administrator oversee the functioning of the system and to ensure that LSN's abide the charter agreed upon prior to a Local Seed Network being registered.